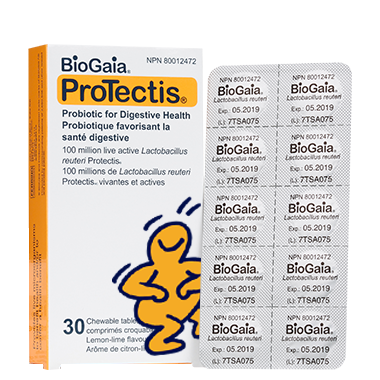 ​BioGaia ProTectis chewable tablets is a dietary supplement containing Lactobacillus reuteri Protectis. Recommended Dose: 1-2 tablets per day. One tablet consists of a minimum of 100 million live Lactobacillus reuteri Protectis. Use regularly for good gut health or when temporary stomach discomfort occurs. Recommended daily dose should not be exceeded. This product should not be used as a substitute for a varied diet. Ingredients: Filler (isomalt), sweetener (xylitol), Lactobacillus reuteri DSM 17938 (Lactobacillus reuteri Protectis), palm oil, lemon-lime flavouring and flavour enhancer (citric acid). With sweeteners. Net weight per tablet, 450 mg. Excessive consumption may have a laxative effect. Great product at a great price. This product sells for significantly more at a local drug store. The product shipped quickly and was of the same "lot" as my local drug store - so exactly the same product. Using this product for 4 years. it works really good! Bought this for our daughter to replace the liquid version. Figured it would last us longer for the price. She loves the taste! I'm taking this probiotic for GERD and it is helping reduce my symptoms. My two sons like the taste and love them. My family physician recommended me this brand in particular after my cholecystectomy and my persistant IBS. It's helped a lot, especially after 3 rounds of back-to-back antibiotics. Tasty and easy on the tummy for IBS suffers and those with lactose-intolerance. Great brand, pure product. Helps my kids get over any sickness much faster than without. My 3 year old daughter reminds me to give them to her if I forget, she loves the flavour. Expensive, but worth it. My daughter loves the flavour. We normally use the liquid version (which we love), but this is perfect for when you are traveling. These are great, especially wonderful for travel (we use the liquid version at home).